Hello again. It´s been a while. Life happened and I forgot all about my good intentions to blog more often. But now I´m back. A few weeks ago I posted a picture of some of the socks I have knitted in my own hand dyed yarns. I thought I´d share some more pictures of them in this post. All of the socks are knitted on 2.25mm needles, just a standard simple socks. 68 sts, 20 rounds of rib, a dutch heel and star toe. I´ve dyed tree different bases and test knit them. A 75/25 wool-nylon blend, a 75/25 BFL-nylon blend and a 75/20/5 Merino-nylon-stellina blend. My project for the next month is to wear them frequently and see if the yarn is strong enough for socks. I´m working on a pair of self dyed yellow socks too, but I´m working on all kinds of things right now, so I have no idea when they will be done. I don´t have just socks on the go. As we speak, I´ve got two pairs of socks and three shawls on my needles. I´ve also knitted a sweater that I need to show you (looooove it!!! ), and my finished “My Shetland Adventure” shawl that was done ages ago. At least 2 months or something… I´ve promised it to my mum, but I wanted a picture before she could have it, so I better take those photos soon! I´ve also been to Gotland since the last time we speak, and I have a few photos to share from that wonderful place as well! So stay tuned! I hope you are all doing well and enjoying the lovely autumn! I´m back with more knitting adventures in hand dyeing land. I finished my green, hand dyed socks the other day, and immediately had to cast on another pair of simple socks from my hand dyed stash. There are two reasons why I´m doing this. 1. Because it is so much fun! 2. 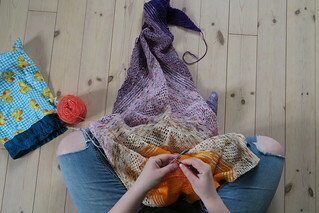 I want to know if the yarn I´ve made will behave in a way that I think look nice when it´s knit up. I personally don´t like very prominant pooling/flashing and I try to avoid that. Being new to dyeing, I want to get an understanding of how the different kind of techniques I use will affect the colour distribution on a knitted item. Now, I haven´t shown you a picture of my finished green socks yet, but I just barely had enough light to snap a picture of my current WIP before sundown. (I will show off my other socks in future post!) Here is my current project. I applied the colours in an other way than I did on the yarn in my last post. I was very curious about how it would knit up, and I´m pleasantly surprised! (Being new to dyeing, almost everything I do that looks good in my eyes surprises me…) I think it has a nice distribution of colour. And I also like the colour combinations. (I was thinking of the Wild pansy flower when I was experimenting with this). And I think I have good enough notes to recreate this colourway. I sure hope so, because it´s looking good! Here is how this colourway looked all skeined up. This is dyed up on 75% wool 25% nylon yarn. Some people have been asking me what I´ll do with the yarn I dye. The answer was that I didn´t know. I´ve been having such a good time with my dye pots, and that was enough. But I´ve come to the conclusion that I need to stop dyeing or start selling. So I will be selling some hand dyed yarn in the near future. Not in a large scale though. My goal is to have fun, and I have a day time job that takes a lot of my time. My Etsy shop is a nice extra income that I use to support my crafting hobbies. But back to yarn. I´ve previously knit up two socks. The result of those knitting adventures are on my Instagram page. Cute yes? I caked it up on Thursday and have been knitting on it since. I´m not a big fan of pooling, and this colourway behaves in the nicest way! I´ve been knitting socks for ever and ever so I´m not using a pattern for simple socks anymore. I cast on 68 sts on 2.25 needles, did 15 rounds of rib, a reinforced dutch heel with a gusset (decreased every third row), and I will probably be doing a rounded star toe at the end. I love this time of year, and I feel like this colourway is a reflextion of whats beginning to happen outside in this wonderful season. I will definately be dyeing up this colourway again after seeing how nice it looks on the needles! I have ordered more yarn to dye. And I´m thrilled about that! This far, I´ve been dyeing up 75% wool 25% nylon, undyed (Opal) sock yarn. But any day now I will get BFL/nylon yarn and merino/nylon/stellina yarn! And that is beyond words exciting! I will be listing yarn in my shop as soon as I can get me some labels! I just have to figure out where to buy them. And while I´m waiting, I´m knitting. Like one does. I´ve been at it again! This weekend I did some dyeing! Thomas went off to help a friend move, and once again I took it as a sign. I had 15 skeins of 75% wool 25% nylon yarn to play with. And I did! Last time I saw my mother, she wanted me to dye up 5 skeins of orange for her, because she would love to knit a sweater with my yarn. So I did that. She will not go unnoticed in this colour… But she said she loved it! And I can´t wait to see the sweater! I also had some fun mixing some colours together before adding them to the pot. That gave me this lovely pinkish colour that I like a lot more than I thought I would… The cuteness is growing on me! Had to dye some more of my yellow colourway, just because I could! This colourway turned out waaaay different than I had imagined, but I love it! And I know what I did, so I think I might try to copy this the next time i dye! Yet another test. Needs a little of tweaking, but I have a good feeling about this! Words can´t describe how green this yarn is… It´s like… straight out of Ghost Busters! Another experiment. I really like the colours in this skein. Might try this again. I love this colourway! Will be making it again! I experimented some more. And this happened. Cute! …but now I´m off to bed. My alarm is set for 0515 tomorrow! Wish me luck!